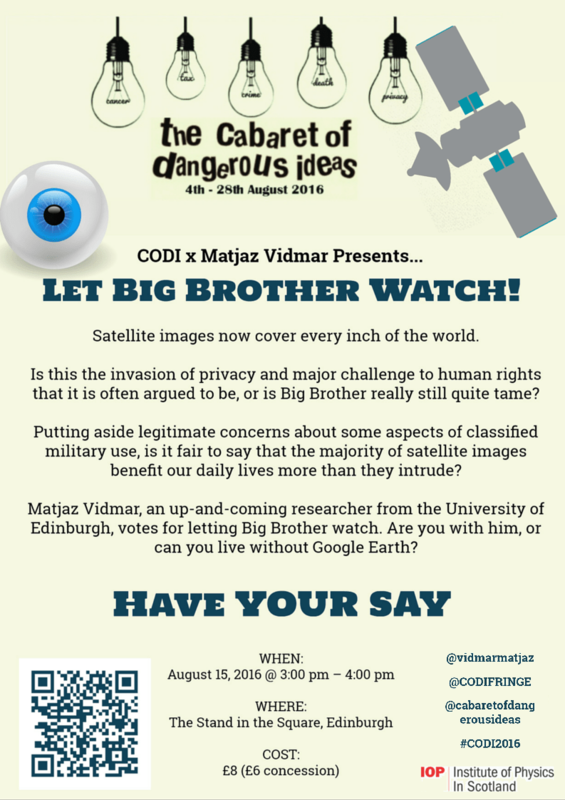 a major challenge to human rights, or is Big Brother really still quite controlled and tame? Is it fair to say that the majority of satellite images benefit our daily lives more than they intrude? And what is the scale and shape of their intrusion? People’s concerns regarding the intrusive “eyes in the sky” turning to “spy” on our back yards, is what interest me. The event will explore these concerns. I hope to explain some of the technical set up of satellite observation of the Earth and the way data from “Earth Observation” is used. Such usage includes various applications related to management of the environment, natural resources, energy generation and consumption, public transport networks. Since I am particularly interested in your views, about half of the show will be discussion based. You can ask me questions and share your opinions and ideas! We will look into both the current cutting edge developments in Space Science, as well as technological applications and the impact they are generating in various contexts of our daily lives. Here, I will draw heavily on my research of innovation and entrepreneurship in the Space Sector. This relates scientific endeavour, technological prowess and entrepreneurial spirit, to generate an advanced Space-enabled economy for the future. Though I am a Physicist by training, specialising in Astronomical Instrumentation, I am a postgraduate (PhD) student in Science, Technology and Innovation Studies (stis.ed.ac.uk). I now primarily research innovation and business incubation in Space Technologies. Examples include satellites and ground-based telescopes. My research is centred on how knowledge is passed from basic research (i.e. science and engineering) into small firms all around Scotland. These firms, in turn, provide products and services to make space technology. They then use the data generated to make our lives that bit easier and richer. Fear not! CoDI’s wonderful compère, comedian Susan Morrison, will be sure to keep the entertainment coming. We may even have special surprise in store for you – a special guest of sorts! Furthermore I am no stranger to a bit of fun. I have done some similarly interesting stuff before! I have previously performed stand up in Bright Club (bit.ly/Bright-Club-First-Degree). 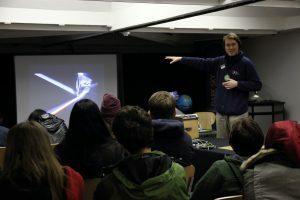 Additionally I am a science communicator at the Royal Observatory Edinburgh Visitor Centre. Here I am speaking to a variety of audiences about Astronomy and the emerging technologies. I assist in the running of the Particle Physics for Scottish Schools (PP4SS, UoE); assist with the delivery of Sci-Fun (UoE), Physics in the Field and Lab in a Lorry projects (IOP); and organise one off events (e.g. Falkirk and Borders Science Festivals). Additionally, I regularly deliver talks to Astronomy societies across Scotland. This event is part of the Cabaret of Dangerous Ideas series (codi.beltanenetwork.org). It is a Beltane Network, Fair Play and Stand co-production for Edinburgh Fringe Festival 2016. Special thanks to Graduate School of the School of Social and Political Science, University of Edinburgh and the Institute of Physics in Scotland (iopscotland.org) for financially supporting this show. Next I-SAT: Heavy on Flavours, Heavy on Space!